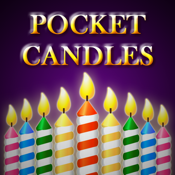 Launch the "Pocket Candles" app and enjoy your cake and blowout your candles and make all your wishes come true!!! You can always have a party with this app. This App with which your friends and family can enjoy turning on and off candles is very quiet fun and very intuitive to use. You can turn off these candles by just puffing at them. To turn on the candles, just swipe the screen on the right side. To turn off the candles, swipe your fingers on the left side. Shake your device to close candle light. Have fun with "Pocket Candles". To enjoy this App on a bigger screen you can play it on an iPad. This App will be updated with more diverse functions. If you want to enjoy it, just download it.